Unlike many people today who jump in and out of marriages so fast it makes my head spin, Noah and Emily meant it when they said they were marrying forever. So, what happened? Why has Noah rented an apartment and made plans to move out the next morning? And this question may sound judgmental, but what person in his right mind can possibly think that his leaving will not have an impact on a four-year-old boy and a two-year-old girl? Noah tries to tell himself that they are so young, particularly his daughter, that they will not remember when he lived with them. What role has social media played in this pending breakup of a marriage? A more important question is what role does social media play in peoples' actions in real life? Noah was all into the social media craze and failed to pay attention to what was really happening at home. But did Emily maybe have a part in the breakdown of their relationship? Some failures are right out there where anyone can see them but others are not so obvious. Does that make them less damaging? I love the way Karen Kingsbury uses members of the Baxter family to stand with a young couple and try to help them stop where they are headed before it's too late. In the process, are there some lessons that Kari and Ryan need to learn? The ten secrets of a happy marriage by Elizabeth Baxter, Kari's mother, are worth the price of the book. I highly recommend this book to anyone struggling in their marriage or who knows someone else who is struggling. Noah is more interested in keeping his social media fans happy than in keeping his marriage and family together. He goes to sleep the night before he's moving out but gets way more than he bargained for. Like Scrooge in "A Christmas Carol," Noah is given the chance to see the consequences of his actions. But when he wakes up, what will he choose to do? Karen Kingsbury is a master at looking at the harsh realities of life and showing that God is there and can intervene. She doesn't sugarcoat the consequences of sin but shows there's a way through if we are humble and willing to grow. In this book, she tackles the tough issues of social media addiction, brain injuries from concussions, and divorce. This is a compassionate, poignant book of second chances. I'd recommend it. Thank you to Howard Books for providing me with a complimentary e-copy of this book. I was not required to leave a positive review. All opinions are my own. 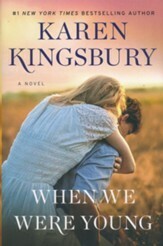 Karen Kingsbury has done it again, in fact "When We Were Young" is my new favorite book!!! This is a very powerful story taking place in just a 24-hour period of time. Once I started reading this book, I couldn't put it down! A MUST READ for sure and yes...have your tissues ready! Real life in a virtual world! What would you do if in 24 hours you caught a glimpse into what your life could possibly be like decade-by-decade, based upon your current circumstances and decisions? WHEN WE WERE YOUNG is the poignant story of Noah and Emily, an Internet-famous couple, whose lives and marriage are greatly impacted by social media. Their lovethe envy of others everywhereis defined and challenged by the extent of their social media fame, and becomes the focus of detriment for their marriage. When Noah has the opportunity to visit the past, present, and future, their lives and marriage are forever altered. WHEN WE WERE YOUNG is relevant and relatablethe story so deeply emotional, passionate and compelling it will connect your heart and soul in endearing, life-changing ways. The storyline is fresh and engaging from beginning to endyou won't want to put it down! As one who has read every book written by Karen, I found this one to be especially intriguing, heartwarming, and thought provoking. I loved how Karen creatively wove Ryan and Kari (of Baxter family fame) into this story to minister to Emily and Noah. I highly recommend WHEN WE WERE YOUNG, and believe that beyond pleasure reading, it would make an interesting study topic for engaged/married couples. This hits close to home as I was in Noah and Emily's shoes as one point. Ready to call it quits on my marriage, believing all was lost. I like how Karen touches on the subject of social media. It can almost become an obsession and we can find our value in it. It seems that might be what happened with Noah. The characters are well developed and you will come to care for them. I also enjoyed meeting up with some of the Baxter family as well. If you love Karen's book you will enjoy this one, her heart-wrenching style is in this book and you might shed a tear or two (or more).